Clearwater Aquarium is famous for bringing "Winter" the baby dolphin, back to full health. 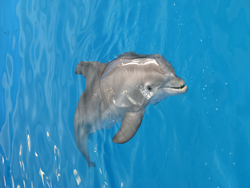 The Clearwater Aquarium is home for "Winter", the little dolphin with the prosthetic tail. 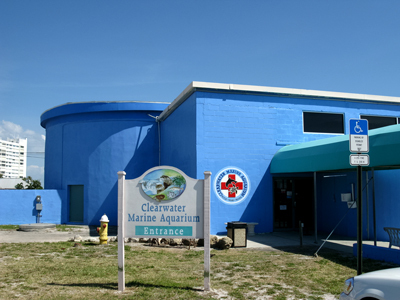 The Clearwater Marine Aquarium (its official name) is a worthwhile attraction to visit in Clearwater FL. It is a non-profit facility dedicated to the rescue, rehabilitation and release of sick or injured marine animals. This is not a "performance aquarium" like you might find at a theme park. All of the marine animals who come here have been injured badly or are suffering with illness. The staff is on-call 24 hours per day (727-441-1790, ext. 234) and the majority of animals in rehabilitation were found by local fishermen and residents. Each severely injured or sick animal brought to the Clearwater Aquarium is examined by a team of marine biologists and veterinarians. From there, a personalized rehab program is created, with the aid of volunteers, to help the animal back to full health. Some animals, however, are injured so badly then cannot be released back into their normal, wild environment and live full-time at the facility. The story of "Winter", the little dolphin found tangled and barely breathing in a crab trap line, captured even the most harden of hearts across Florida. She was only 3 months old, abandoned by her mother, and severely dehydrated when rescued by a fisherman in Mosquito Lagoon over by Cape Canaveral, FL. The line had cut off the blood supply to her tail. During her long rehabilitation she not only lost the tail...but also two vertebrae. While fortunate she was not killed, like many dolphins tangled in monofilament line or crab trap lines...she had to learn to swim with a entirely new pattern. Instead of the beautiful undulating movement associated with dolphins, she now moved her body laterally like a shark. There was strong concern by the scientists and veterinarians at Clearwater Aquarium that the side-to-side movement would give her spinal cord problems. Kevin Carroll, vice president of prosthetics for Hanger Prosthetics and Orthotics of Bethesda, Md. read about her plight and developed an artificial tail for her. In doing so, he has enabled the trainers at the aquarium to help Winter recreate her powerful and natural swimming motion. Kevin Carroll continues to improve his design and Winter continues to thrive. She is now 230 pounds and eats fish on her own. Daily, trainers work on a structured physical therapy regimen of bending her tail up and down to keep her specific propulsion muscles strong. Her story and her desire to thrive have been inspirational to both children with prosthetics and armed forces veterans who have been severely wounded in the Middle East war.